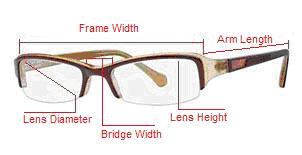 Buying Eye Glasses Online - FAQ - Rx Frames N Lenses Ltd.
How do I choose a frame to suit my face shape? We offer a one-time exchange only policy on the return of any eyeglass frames or sunglasses within 30 days of the shipping date at no charge. The shipping of your exchanged frame is also free shipping back to you. Free shipping does not apply to International orders. All original packaging, frame bags, certificates, and warranty cards must be returned in resaleable condition. Products that are returned and not exchanged will be charged a 15% restocking fee. Others charge a flat fee plus shipping. We simply charge a percentage to cover shipping and handling to and from the Manufacture and the original free shipping to our customers. If you paid extra for upgraded shipping this charge is not included in the 15% restock fee. Most frames have a Manufacture warranty for one year from the date of purchase. A frame warranty is for Manufacture defects only, not damage induced by the wearer or conditions such as breakage, heat, moisture, etc. Any warranty request that does not meet these requirements may be refused and shipped back to the original shiiping address. We will not be held responsible for refused warranty replacements not received by the customer. When returning a frame under warranty in the event a frame is discontinued by the Manufacture and we can no longer get the frame, we will replace it with a different frame at equal or lesser value. We will not be responsible for your prescription lenses. If your prescription lenses were made by us we will remake your lenses into the new frame at 50% of the original cost. A $10.00 shipping and handling fee will be charged on Frames sent back under warranty. 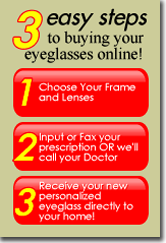 We guarantee 100% accuracy on all prescription lenses or they will be remade at no charge. 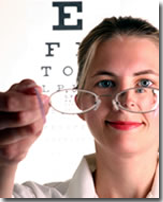 All prescription eyeglasses are inspected and pass a rigid quality control inspection. The lenses are checked for prescription accuracy by our licensed Opticians along with frame and lens alignment. Lenses have a one year warranty against Manufacture defects, such as peeling of coatings. Damage induced by the wearer, such as rough handling, dropping, scraping and improper cleaning will not be considered Manufacture defects. All of our lenses come with a scratch resistant coating, however no lenses are scratch proof and require proper cleaning and care. Crizal Anti-Reflective coatings have a two year warranty against Manufacture defects. Any lens warranty return that does not meet these requirements may be refused and shipped back to the original address. We will not be held responsible for refused warranty replacements not received by the customer. Before returning a product for exchange or refund, please obtain a RMA ( Return Merchandise Authorization) number. E-mail us with the reason for the return or exchange at eyewear@rxframesnlenses.com. We will email you a RMA number. RMA numbers expire after 30 days. Returns must be post marked within 10 days of receiving your RMA number and received by us within 30 days of the RMA number issue date.